Are you ready for the 2014 World Cup? We bet you are! And we also believe that you are eager to learn more on the football tradition in the Philippines! The Philippine national football team, nicknamed “Azkals” (street dogs), has not yet made any appearance in the World Cup, even if in 2011 the Philippines recorded their first ever victory in FIFA World Cup qualification, beating Sri Lanka in the second leg of the first preliminary round (unfortunately, Filipinos were eventually beaten by Kuwait in the second stage). Although their favorite team is not ranked among the top clubs in the world, Filipinos have a solid football tradition, dating back more than 100 years ago, and they love playing this sport. Football is quite popular in the Philippines, even if it is overshadowed by basketball, which is the most-watched and most-played sport in the archipelago. Football was first introduced at the end of the 19th century by English sportsmen and returning college students who had learned how to play it abroad. In 1907 the first official match was held in Manila, but football started to be very popular only in 1912 when Pulino Alcántara became the first Filipino and Asian footballer to play for a European club, the FC Barcelona. He was only 15 when he began and he remains the youngest player to play or score for the club. In addition, he is one of FC Barcelona’s all-time top-scorers (369 goals in 357 matches), just behind Lionel Messi. Thanks to his success many Filipinos started to play football and the popularity of this sport has increased over the years. Sport is also important for social inclusion and to promote human rights, because on the pitch all players are equals, regardless of where they come from or how much money they have. Just before the beginning of the FIFA World Cup, Rio de Janeiro hosted the Street Child World Cup, a global movement that advocates for better opportunities for street children. 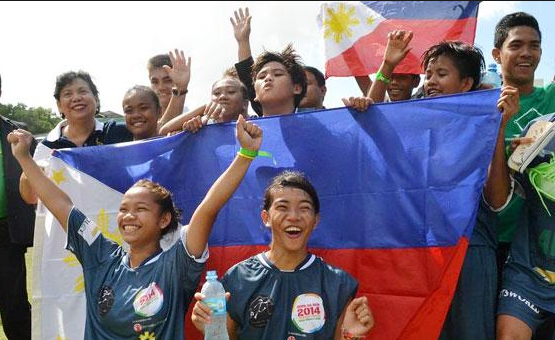 The Philippines were represented by both a boys’ and a girls’ team, campaigning against glue sniffing. Are you sad because you cannot support the Filipino team in the World Cup? Well, you can still support Kito’s projects in the Philippines: all children have the right to enjoy a healthy life, go to school and play… football!